Owning Model S is exactly what it sounds like: a complete book that breaks down everything a potential Tesla owner should know. It is, in my opinion, a must have book for those considering buying a Model S and a should have book for those awaiting delivery. 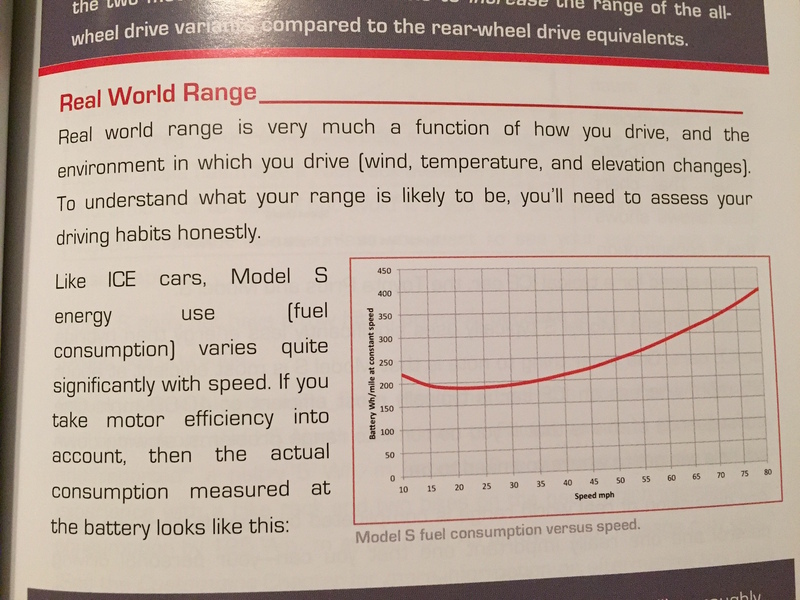 (Or Model X, really, because this book does a great job of explaining the overall points of the vehicle.) It will explain, in clear and concise terms, everything you need to know to make an educated and informed decision about whether or not to buy, what to expect, which options to order and how to feel confidant getting ready for that first drive home. I also really liked it as an experienced owner, even already knowing the majority of what is covered because it goes into some really great detail, providing data or graphics where required, to provide clear explanations. I still recommend it if you’ve been enjoying your car a while as the book will remind you how exciting the car is. The book is easy and quick to read yet comprehensive. It is intelligently written yet still accessible. It does not shy away from complexities where needed yet does not require an engineering degree to decipher. It is also a very pleasing physical size that lends itself to ease of packing as a travel read and storing in your Tesla once you own one. The goal (at least for Elon) was not to build a successful car company per se, but to prove to the large auto makers that it was possible to create a successful, sustainable, electric car company, thereby spurring them to enter the market more aggressively than they would otherwise do. Starting on Page 19, the book also does an excellent job of explaining drag in a way that is easily understood. To summarize, a car’s mass has to push the air’s mass out of the way as it moves. That’s no easy task but every inch of the Model S is intended to help with it. A bit later in the book, on page 53, there is a fantastic explanation of full torque at 0 revolutions per minute (rpm) and why Tesla acceleration is so awe-inspiring. I often tout this feature to folks who ask about the car but never really have an explanation. Now I do! Plus, this section includes a really great comparison of the Ferrari Tom Selleck drove in Magnum, P.I. 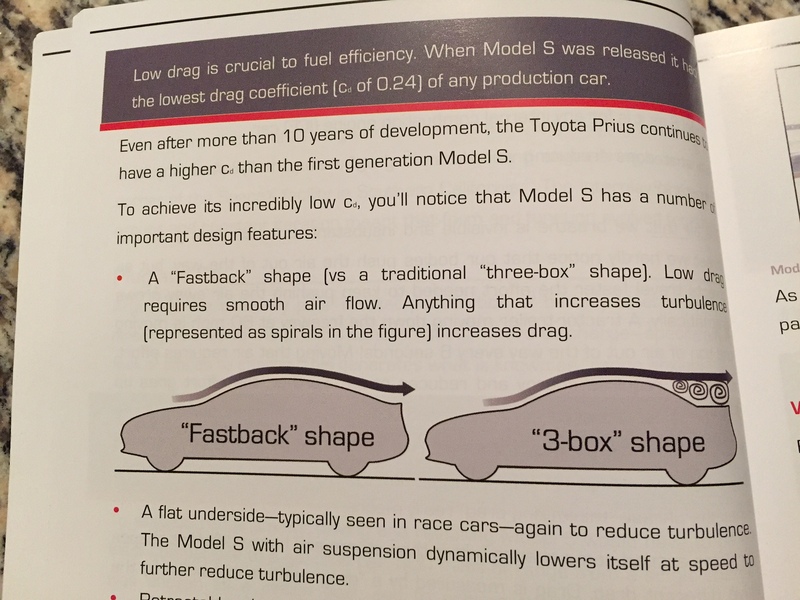 (Second spoiler: the slowest MS in the current lineup is 2 seconds faster to 60 mph.) This section also reminds us that published 0-60 times for other vehicles include professional drivers manipulating a clutch with expert care. The Model S just requires you to stomp your foot and hold on to the wheel. I won’t talk about how this section’s discussion of the complicated internal combustion engine reminded me that the entire auto industry is a sham. This book gives a very straightforward description of available options as well as the author’s opinion on each. It is comprehensive, if a little biased, but I still appreciate each part. For me, the panoramic moon roof is the must have and air suspension unnecessary. As the book will tell you, each option is very personal and you will be able to customize to your unique preferences. The delivery checklist is arguably the most important part of this book. In fact, the book evolved from it. If nothing else, get the book for the checklist. It will prepare you for a delivery that will almost certainly be completely unlike any other car buying experience you’ve had. Along with the delivery checklist there is a great guide on setting up preferences ahead of your first drive. Little tidbits like not programming your Homelink while at work are much needed, as your delivery will include so much information and excitement, some things will undoubtedly be lost. The beauty of a review is that it is an honest opinion. As I mentioned before, I think the options recommendations are a bit biased. But they should be! Nick J. Howe is an extremely knowledgable owner and his opinions on which options to order are as good as they get. Mine differ; some driven by cost, others by personal preference. To me, premium sound and air suspension are things you can leave behind. Yet as mentioned above, I find the pano roof to be one of the most beautiful parts of the Model S and an absolute must-have, only second to Autopilot. I also happen to disagree with his directives on care. Nothing he says is wrong and his wash methods are perfect. What I can’t get behind is the recommendation to wash the car weekly. Our Model S is our daily workhorse and since there are only 24 hours in a day, washing the car only rarely makes the cut. If you enjoy and have time to wash your car weekly, go for it! 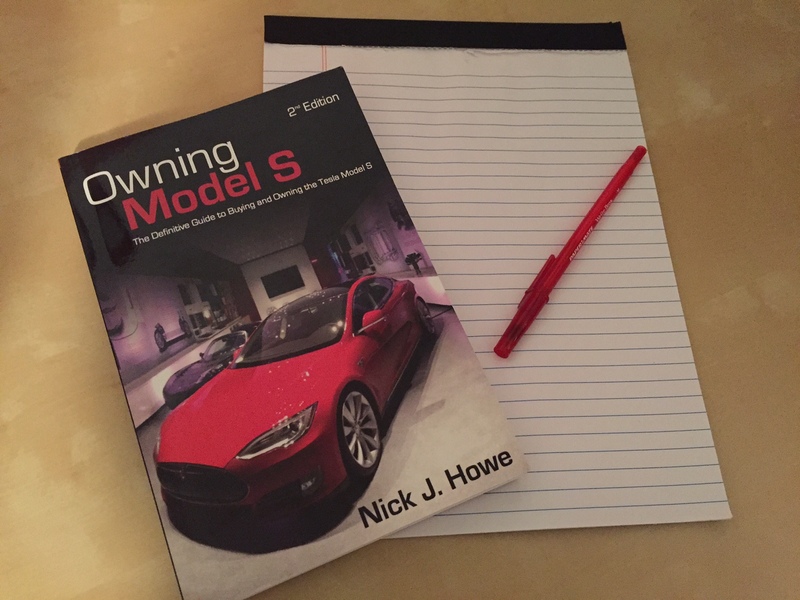 Buy the book if you are considering getting a Model S and want to be informed. The 2nd edition has been nicely updated to include discussions on Autopilot and current offerings. While you wait for it to ship, go ahead and request a free chapter of the book, available for a limited time. I’d also recommend buying the book (or naming it the next time someone asks for gift ideas) if you are awaiting delivery or are already an owner but have not otherwise studied up on some of the more intricate details of how the car works.